"Anti-homeless" benches and spikes used to deter rough sleepers should not be used in Wales, two charities have said. The Wallich said so-called hostile architecture makes life more difficult for homeless people and "pushes them to the peripheries". A petition against it was signed by 120 people and debated by a Welsh assembly committee. Both Swansea and Cardiff councils said they had not designed benches to prevent homeless people lying down. Private landlords are allowed to erect fences of up to a metre high, or install items such as spikes which could be classed as hostile architecture without planning permission. The group behind the petition, People Over Profit, said the the practice was an "attempt to hide the homeless". The Wallich said it is "concerned about the growing amount of hostile architecture in urban environments and its effect on people experiencing homelessness." "We disagree with any infrastructure that makes life more difficult for already vulnerable people," it added. "If the intention is genuine, bench barriers for example are sometimes said to aid mobility, then planners need to recognise the effects their structures could have on people who are homeless and incorporate them into their impact assessments." But councils have denied the intentional use of hostile architecture to prevent rough sleeping. "The notion that the council is buying benches with features designed to stop rough sleepers using them as beds is frankly ridiculous," said councillor Lynda Thorne, member for housing on Cardiff council. "What's important in all of this is getting rough sleepers off the street, not worrying about whether lying on a bench is better for someone than lying on the floor." A Swansea council spokesperson added: "It is absolutely wrong to suggest that the council has introduced 'hostile' architecture in Swansea. "Anybody who visits the city centre will know that we have a range of bench and seating styles which, between them, attempt to offer comfort to all our residents and visitors. "For example, some older items feature several armrests which are useful for people who need support to stand up after a rest. "The council has done a great deal of work for rough sleepers and has a new strategy to tackle homelessness. We ensure support and advice is provided to rough sleepers within 48 hours." Homelessness charity Shelter Cymru echoed the calls from the Wallich, but said it did not have specific data for Wales on the topic. "The use of hostile architecture such as spikes, armrests in the middle of benches and railings to prevent people who are homeless from being able to lie down or sit in certain spaces chimes with a wider intolerance of people sleeping rough," a spokesperson said. "The resources spent on designing, installing and maintaining these barriers would be better spent on addressing the root causes of homelessness to prevent it from occurring in the first place; and ensuring that where it does occur, meaningful solutions are on offer. "We welcome the proposal to include this issue as a planning matter." Architect Jonathan Adams told BBC Radio Wales benches designed to stop rough sleepers were "ubiquitous and horrible". 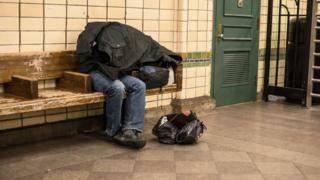 Local authorities or private landlords are responsible for street furniture, but the Welsh Government said it had committed £30m to help tackle homelessness.